One day I was running late for my yoga class and driving a little faster than usual. On the winding road into town I noticed a turtle slowly moving across the road in the left lane and had no problem driving past her. But further along I saw another turtle crossing from the right side of the road and made a calculated decision to straddle her between the wheels of my Jeep. 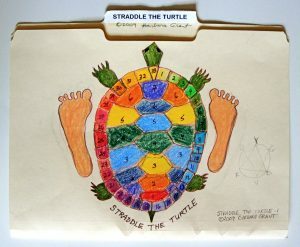 Afterward I kept thinking, “I straddled a turtle… I straddled that turtle… I straddled the turtle!” I made it to my class in time, but I had trouble focusing as I thought of the harm I could have caused that fertile turtle. I also admitted a truth to myself – I have a chronic habit of trying to do too much in too little time.